I started visiting Angela in July 2011 in the hope of trying to gain some control over the severe IBS that I have suffered for several years on and off. I have had lots of tests and everything luckily has always come back negative, so I knew that there was nothing medical to be concerned over, however I continued to have the problem. I always believed the reason I continued to have this problem was because I allowed it to control me and cause me stress, so I knew I had to take back control once again. I have been visiting Angela every couple of weeks since July, not that I really need to, as my problem has improved so dramatically, to the stage where I now leave my home without even thinking about what difficulties I might experience. I have found that reflexology really works for me, I find it so relaxing and I do look forward to my visits, more though as a treat now and not as a medical remedy. So thank you Angela for initially your support and lately your friendship. After being referred by my GP to have reflexology I found Angela at Balance Reflexology, or as I like to call her, my knight in shining armour. Prior to Angela's reflexology sessions I hadn't had a regular menstrual cycle for years, had unbearable sleeping patterns and generally felt unwell. Angela at Balance reflexology has given me a new lease of life and I am now able to move on with a healthy body and mind thanks to Angela. Angela truly is an angel and I wouldn't hesitate to recommend her to anyone, whether you are just feeling a little under the weather or have a serious complaint - I truly believe Angela can help to heal through the power of reflexology. I am currently 37 weeks pregnant and have been having regular Reflexology treatments since I was 32 weeks. The main reason was to help me relax and to have a bit of 'me time' before the arrival of my baby. I can honestly say it has totally relaxed me and has helped with regulating my sleeping pattern and also has helped with all those niggling aches and pains you get towards the end of your pregnancy. I feel completely chilled following a session and often have a little nap during the treatment as the atmosphere that Angela creates and the way she puts you totally at ease you just can't help but relax. I find Angela to be very professional and yet still makes you feel so welcome and comfortable in her company. Her treatment room is very calming and practical including lots of comfy cushions to help me get into a good position being heavily pregnant. The fact that Angela has such a wealth of knowledge not only on reflexology and maternity reflexology she also has the background of being a midwife and nurse which just makes me feel so much happier that I chose the right person to see me through the latter stages of my pregnancy. 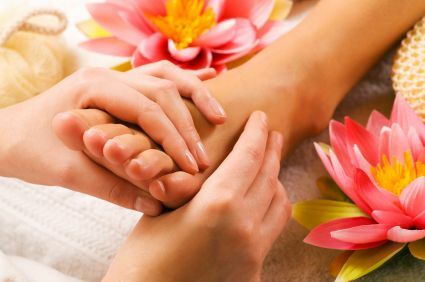 I have no hesitation in recommending Angela to anyone who is interested in experiencing reflexology, and I'm certainly looking forward to continuing my treatments. It is impossible to count how many times I have been truly thankful that I found 'Balance Reflexology' when searching for a local therapist. From the first appointment it was obvious to me I had found not only an excellent Reflexologist but also someone who is able to instinctively give to her clients empathy, compassion and understanding if needed, which I did! What a joy and pleasure to lay back and simply relax in the wonderful environment that has been created with love and thoughtfulness by Angela. Each session has been an absolute delight. Angela, I will be forever grateful you entered my life at what was such a difficult time for me and for the support given which has helped me regain full health. I could wear some of my old shoes again.